It’s time for my biannual look at the exit polls. This won’t explain everything about Tuesday’s election. It’s not intended to. What it is intended to do is provide a baseline that shows where Democrats did better and where they did worse than they did in the last midterm election. First things first: In 2006 Democrats won the popular vote for the House of Representatives by about 8 points. In 2010, Republicans won the popular vote by about 6 points. That’s a shift of 14 points. There are plenty of broad structural explanations for this—the economy, dislike of health care reform, whatever—but beyond that, we’d also like to know if there were any specific groups that helped power this Republican victory. Was it the youth vote? The evangelicals? What? The most intriguing result here is the top one: People who didn’t vote in the previous presidential election shifted into the Republican camp at a fantastic clip. I have no idea why. Maybe people who suddenly care about voting even though they didn’t two years ago are usually motivated by animus toward whoever won. Hard to say. Still, intriguing though this is, the actual number of people in this category is small enough that it’s not especially important. important because their big Republican shift was accompanied by higher turnout. Conversely, although rural voters also shifted Republican in big numbers, their importance was diluted because their turnout was down. And then there are the “independents.” The scare quotes are deliberate, because it’s hard to know what to make of them. It’s a big group and it shifted strongly Republican, which makes them an important factor in the election. But there’s more to this. Self-described “moderates” turned out in lower numbers than in 2006 and shifted Republican in lower numbers than average. 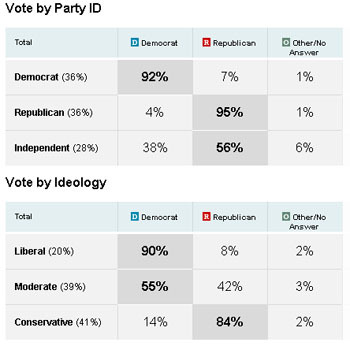 Put these two things together and they suggest that there’s a large number of independent voters who have shifted their self-ID from moderate to conservative. Were they really conservative all along but only started fessing up to it this this year? Or is there a genuine ideological shift in progress? Hard to say. But either way, this year they showed up at the polls in much larger numbers than in 2006. This is the famous “enthusiasm gap,” likely driven by tea party fervor and millions of dollars of Medicare demagoguery. So: White voters and older voters swung big, and conservative leaners turned out in bigger numbers than usual. Add to that Northeasterners and Catholics, and you’ve accounted for most of the big swings. Self-described liberals actually voted for Democrats in bigger numbers than in 2006. They also showed up to vote at the same rate as 2006. Unfortunately, conservatives showed up in bigger numbers, swamping the liberal tide. Likewise, African-Americans stayed loyal to the Democratic Party, but their numbers were too small to make a big difference. And finally, the youth vote. According to CIRCLE, turnout among young voters was down compared to 2006 (20 percent vs. 23 percent). And while they swung away from Democrats a bit, it wasn’t by much. They remained pretty loyal to the Ds, but they just didn’t show up to vote in big numbers. So that’s that. We’ll all be arguing for months about what the big narrative is, but at least if someone tells you a story about how it was evangelicals or blue-collar workers or Hispanics that really made the difference, you’ll know just how big a difference they really made. In a few cases it’s a lot, but in most cases it’s not. After the Disaster, What’s Obama’s Next Act?